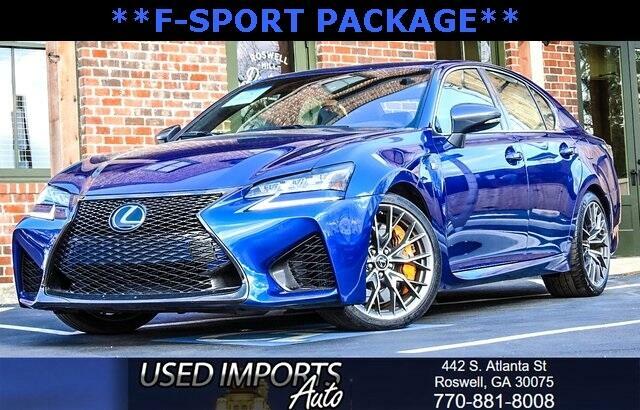 **GS F Super Sports Package**467 Horses / 389 Ib-Ft Torque**Carfax Certified**Carfax 1 Owner**Rare Package w/ Navigation**Back Up Cam**Push Button Start**Rear Power Shade**Driver Memory Seat**Heated/Cooled Seats**Bluetooth**Bluetooth Audio**AUX Input**USB Connect**Power Sunroof**Keyless Entry**Power Trunk Lift**Leather Seats**Dual Climate Control**Steering Wheel Controls**Must See**All Power Options**Plus So Much More...Recent Arrival! Clean CARFAX. CARFAX One-Owner. F-Sport Package Stratus Gray w/Leather Seat Trim. Odometer is 10444 miles below market average!!! CALL US TODAY!! CALL 678-720-9710. FINANCING AVAILABLE WITH QUALIFIED CREDIT!! ADDRESS... 442S Atlanta Street, ROSWELL, GA 30075 WE ARE OPEN 7 DAYS OF THE WEEK. MORE PICTURES AVAILABLE ON WWW.UIAUTOS.COM FORGET MATCHING PRICES WE KEEP THE BEST PRICES IN THE MARKET!! Visit Used Imports Auto online at www.uiautos.com to see more pictures of this vehicle or call us at 678-720-9710 today to schedule your test drive. We try our best to list all options and details carefully however typos and human/machine errors are possible, please call in advance to confirm any specific options, colors, condition related questions to avoid any confusions. We train our sales staff regularly however any verbal claims or promises made by the employees of the dealership are not valid unless expressed in writing. Registration, titling, taxes, mailing, paperwork handling, vehicle inspection, warranty rights administration and processing charges vary from state to state and are not included in the price listed. All sales are AS-IS unless expressed otherwise in writing. Vehicle accessories such as extra keys, floor matts, books, navigation disc, shift knobs etc may not come with the vehicle however we can always order these items at our discounted dealership prices which are to be paid by the customer. Message: Thought you might be interested in this 2016 Lexus GS F.